When our clients take the time to write, it's so much more meaningful than any recognition we could get. We treasure these heartfelt comments, ​and thank you from the bottom of our hearts! I seriously don't even know where to begin my glowing review of Hannah, John and their adorable team at Hawaii Island Events! Long story short, we had a difficult time with our first wedding planner and decided to remotely DIY the planning process, eek! My then-fiancé (now hubs!) reached out to Hannah directly and briefly explained our vintage Hawaii, 70s rock n roll vision and she immediately started sending us beautiful proposals, vision boards and a very clear-cut, fair-priced cost sheet. Hannah's celebratory, positive, and helpful communication (even with the time zone differences!!) made the planning/rental process a breeze. Additionally, as we started booking other vendors they all gushed about HIE and how they loved working events with Hannah, John and their crew- that definitely confirmed that we were working with THE BEST!!! Throughout the planning process Hannah was incredibly communicative, even going as far as recommending other local vendors and helping us source things (aka booze!!!) we would need to get on-island. Hannah and John also made the time to meet with myself during my Hawaii vacation pre-wedding so we could walk the venue together and show us where certain decor/furniture would be laid out. They were genuinely excited for our big day! Not only were they super professional and prepared (Hannah brought the custom bean bags SHE MADE for our lawn games, seat cushions, runners, a map of table dimensions and lighting) - but Hannah & John are the sweetest couple that are a shining example of love and friendship. Day of....our setup was effortless and so easy! Granted, I was in the jacuzzi most of the day but as my mom and groom were checking in they said everything was going beyond smooth and the decor was more than we could have imagined!!! And it absolutely was. HIE's attention to detail made our wedding so special and memorable. From the orange shag rug in our pina-colada machine tiki bar to the market lanterns John expertly hung in the lanai and trees- everything was PERFECT!!! When our wedding party came to a close, HIE made clean up and tear-down so easy. We love how incredibly respectful they were toward the venue and our lingering guests. We were so happy to have HIE as an integral part of our wedding day. We're thinking we want to host an event or party every time we're on the Big Island just so we can work with HIE's fabulousness again!! Thank you all so much for everything! Everything was so beautiful thanks to the lights! Thank you for the chairs and the sound systems. You folks are awesome! Thank you so much! The venue, chairs, center pieces was everything and more we could ever imagine! Thank you guys so much! Our day truly was perfect, and it meant so much to be surrounded by so many wonderful vendors. We feel so blessed by the amount of time and effort you both put into making our day so special. Again, thank you so much, and God bless! I just wanted to take a minute and give you some praise! Thank you so much for all your hard work and help in getting this arranged! I truly appreciated it as did Lisa. Your team did an amazing job, arrived on time help get things into the area I needed them, and they even wiped the chairs off! Truly an amazing experience had by all! I hope we can do more business together in the future! Wonderful vendor!! Hawaii Island Events recently serviced my wedding at Kahua Ranch and did a beautiful job with the set up. We used their services for ceremony chairs, an adorable lemonade stand for flavored waters outside the ceremony, lawn games, reception tables and chairs, linens (tablecloths and napkins), lighting, and a few other miscellaneous things. Everything turned out beautiful. They are not a design company so you (or your wedding planner) has to come up with the design and what supplies you will be requesting. They are have a huge selection of supplies, are very professional, great with communication, and accommodating. 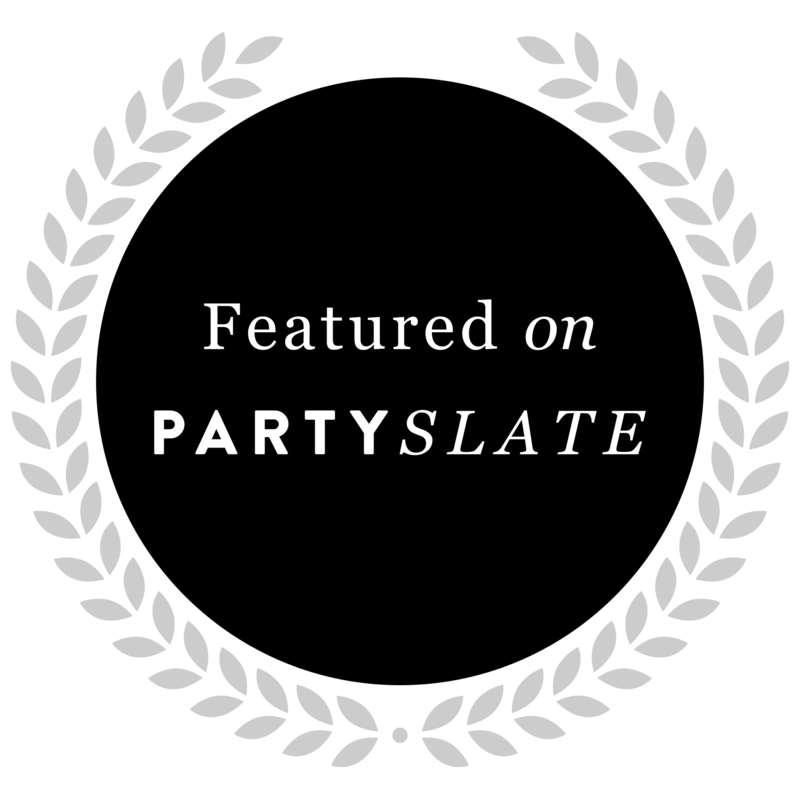 I would absolutely use them again for future events and recommend them to anyone. Just wanted to tell you how pleased we were with everything you provided for the wedding. It was absolutely beautiful and the location change was well worth it!!! The Sheraton people were amazing and so helpful and kind. We were blown away when we arrived and everything was set up and didn't have to lift a finger!!! I will definitely tell anyone looking for a wedding decor specialist to look you up! Professional, courteous, integral, creative and willing to do what it takes to get the job done. They were amazing to work with and their knowledge of the various venues on island and site nuances was extremely beneficial. They were early, they stayed late, they were on budget and they offered extra services simply because they wanted to make my vision come true! 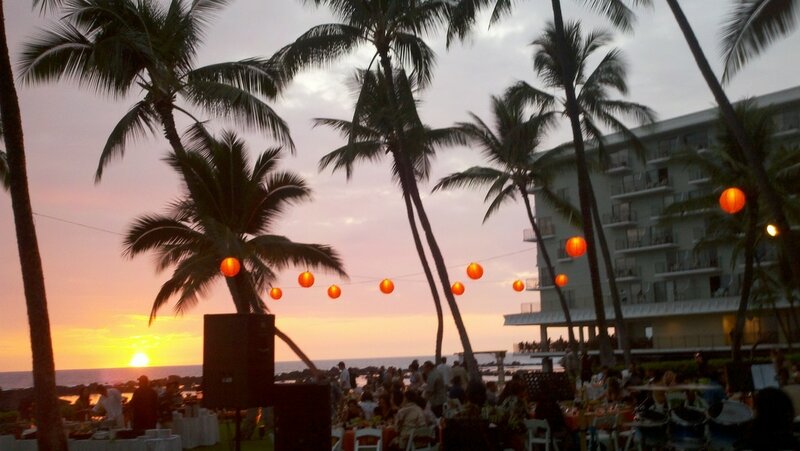 If ever you need an event planning/service company use Hawaii Island Events. 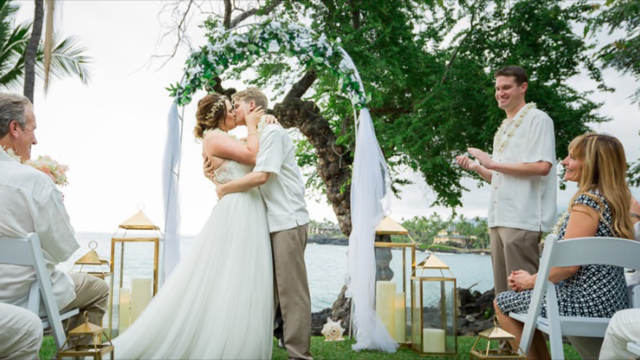 "Hannah and John and the rest of the Hawaii Island Events were amazing to work with for our wedding. We rented tablecloths, chairs, banquet tables, and a dance floor from this company. The prices for these items are either great (as in better than competitors) or reasonable (about the same as competitors.) As for professionalism, flexibility, and service, I could not be more pleased. Hannah communicated well through email as we lead up to the event and even ordered us additional tablecloths so all of our linens would match. John showed up the morning/evening of the event to set-up and take down, and he was extremely personable and hospitable. I appreciate everything they did for us and I will work with them again in a heartbeat." Thank you soooo much for ordering the sheets. We truly appreciate you. You have been so accommodating with all of my back and forth and inability to make a decision or get a guest count and without you, this would have been a lot more difficult of a process! It was such a pleasure working with you guys! I appreciate your patience and working within our budget. You truly delivered everything you say on your website:) I will be sure to spread the word as much as I can about your services and hopefully get the chance to work with you in the future on another wedding!! Mahalo for everything and God Bless!! Just a quick thank you to let you know how much I appreciated all your kind assistance putting together the rentals for our Kona wedding. Everything was perfect – convenient – easy – WONDERFUL! Mahalo Nui Loa for all your help! 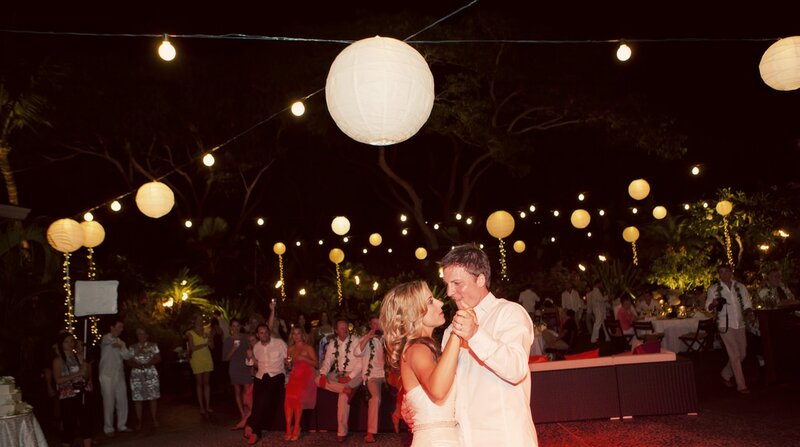 Hawaii Event Lighting was a phenomenal company to work with on our Valentine wedding. John and Hannah went above and beyond what we expected and did an outstanding job planning the lighting at our reception. As a destination bride, it was a challenge to plan a wedding from the mainland. However, the team was very hands on in helping me with a design that completely blew our guests away. The monogram they designed to shine onto the surface of the pool was a huge hit! I couldn't have asked for anything better. 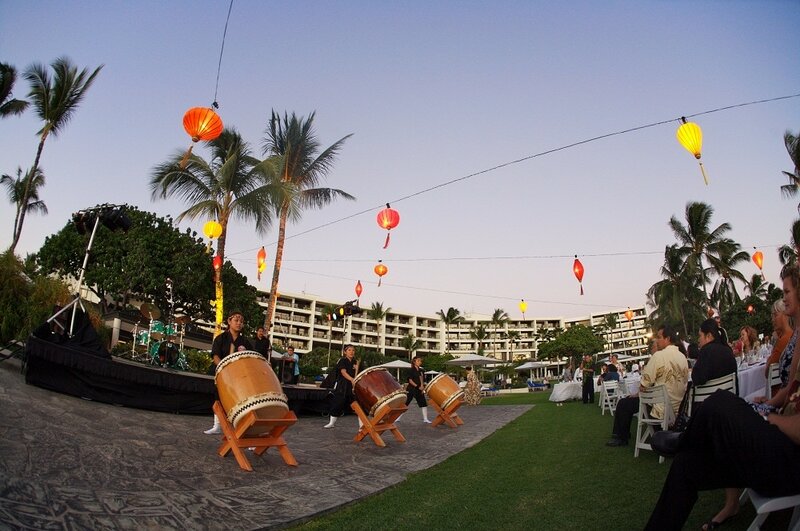 I highly recommend Hawaii Event Lighting to anyone looking for excellent service. Everything we asked of them was perfect and we thank you from the bottom of our hearts for all your hard work. Hi Hannah and john. what perfect timing, I was just thinking about emailing you. Kent and I have been going over and over the details of our wedding day. We appreciate everyone's huge efforts and hard work. it was everything i'd imagined and more. all of our vendors were so wonderful to work with..but....and we mean this sincerely. john was AMAZING. we were so impressed by his hard work and efforts. i am definitely recommending you guys to anyone who asks. john has integrity and a work ethic that is rare these days. he went 500 miles beyond anything we could have asked for and i truly think that his efforts MADE our wedding. as an interior designer i know how important lighting is to any space and he accented everything that i've been working a whole year on perfectly and seamlessly. we thank you so much and we wish you guys much success. i will be sending along any pictures from my photographer as soon as we receive them. she's going to try and get our wedding published. We would like to thank you from the bottom of our hearts for helping make the reception soo... beautiful. From the monogram to the up lighting. We couldn't have been happier with the finished product. It was wonderful to see the dramatic and elegant effect the lighting had on the waterfall and gazebo. Again, Mahalo, we couldn't have been more pleased. It was a beautiful wedding indeed! I walked into the reception room and started crying. I couldn't believe my eyes. The ballroom was transformed into a romantic, magical place. The fuchsia lighting on the stage, combined with the back lighting of the pillars and the palm trees, gave the room a dreamy feeling! It felt like I was walking into a fairy tale. The lighting tied the whole room together, and the dance floor made for a great party! Thank you for the excellent product and the phenomenal, personalized service. Your company embodies utmost professionalism combined with personal warmth --- and sincere spirit of Aloha! Both Tim and I are very grateful for everything you did for us, for accommodating our budget and still giving us the best experience possible. Our experience was truly unique, and we will never forget your kindness! Thank you so much Hannah! Everything was beautiful and perfection! I wasn’t there during the set up but I was told that the impression was that “the guy who put up the lights was really enthused about his craft” and that’s awesome too! Thanks so much! 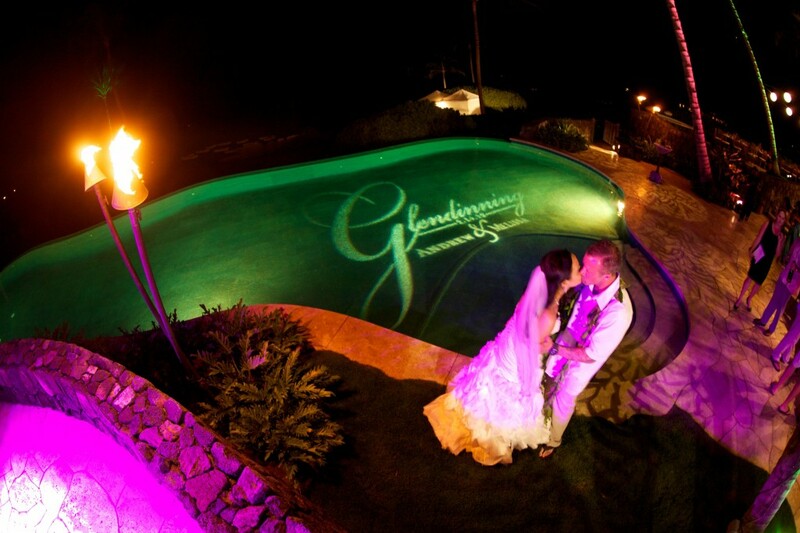 The Goodalls sure enjoyed the beautiful lighting of their wedding! 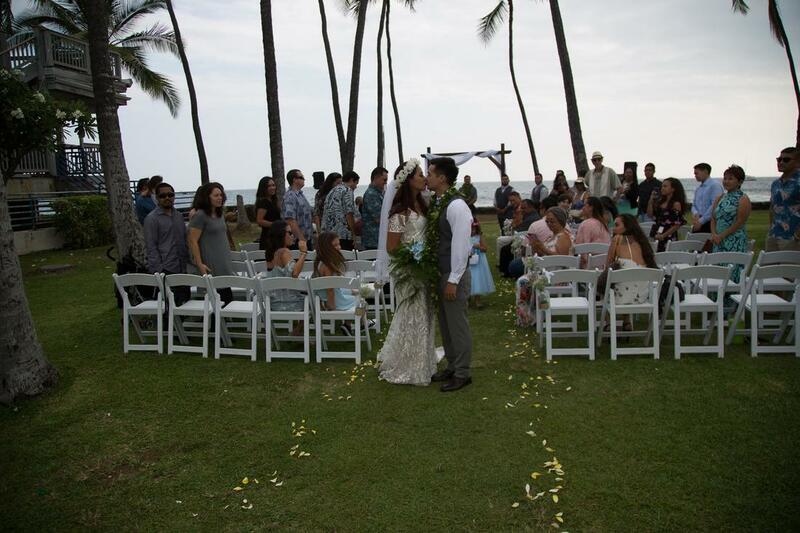 Dear Hawaii Island Events, Thank you for helping to create such a wonderful and beautiful wedding for us. You all were amazing! I wanted to let you know just how blown away I was by everything you guys did. EVERYONE was raving about how beautiful the rooms were - and I totally loved the draping! Thank you for all your creativity and execution. You guys were SO awesome to work with! Of everyone I worked with, I truly loved working with you guys the most! What an UNBELIEVABLE job you guys did. The reception was BREATHTAKING! It was more than I expected. Everyone said it was the most beautiful wedding they've ever seen. Thank you so much for everything! 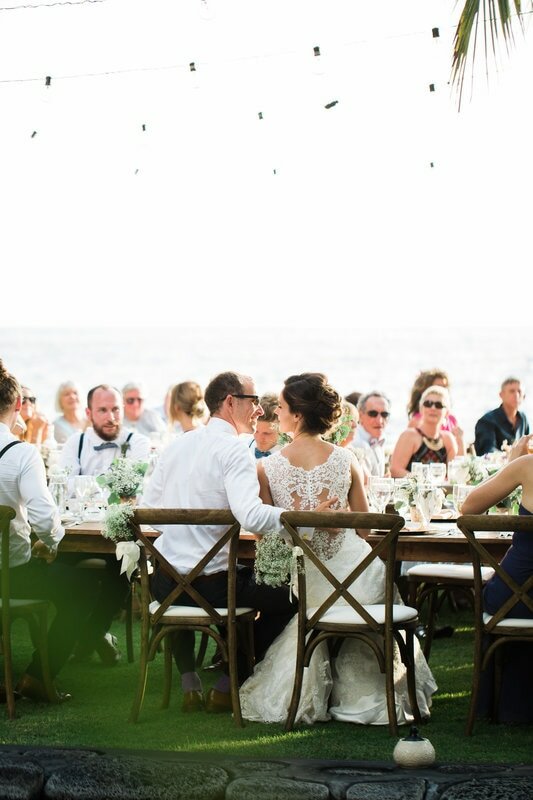 The tables, chair, lighting, and dishes we used from hawaii events was all very beautiful. I also used a couch and fire pit outside which created very nice ambiance. Good service, it was nice to have it delivered, set up, and then picked up. Made it worry free for us! I got married at a private estate and had to hire everything from tables, chairs, lighting, etc. HIE was amazing to work with and provides an extensive range of items for rent to help you achieve the look you want. I engaged them a year out from our wedding and made multiple changes to my order throughout the year up to two days before the wedding. They were extremely responsive, professional and great to work with. They were like little elves setting up and taking down. You barely noticed they were there and they were finished. I found the service they provide to be great value for money and would definitely recommend them for any event. Rented twinkle lights, ceremony arch, dance floor, table linens, napkins, and etc. They were really good about quickly resetting their lighting before it was a problem when it tripped/got unplugged and everything was delivered early to allow my planner to begin set-up on time. The Blush Glitter Linens for my reception tables, cake table, and guestbook table were beautiful and classy. Perfect for my beach formal wedding. Thanks Hawaii Island Events! Thank you for everything. It was all great. I would definitely recommend your services. I would like to Thank you from the bottom of my heart for helping with our party! Like I've told your husband, the linens made a very big difference and definitely helped make the table decor beautiful. My mom loved everything, with the cocktail tables as well. I would like to also like to thank you again for providing the extra linens free of charge, complete life saver! I will definitely be recommending your business to others, you all we're amazing and so well to work with. Big Big Big THANK YOU! Hannah! So sorry for the month delay, but just wanted to thank you so much for the amazing, beautiful, incredible job you did on our lighting! Talking to you about the description is one thing, but seeing it in person was something else. The view of your lighting in Cococut Grove from across the property as we left Turtle Pointe was spectacular, and added a lot to an amazing evening. Overall, I can't thank you enough. It was truly unforgettable! It was amazing! The lighting was one of the major highlights for my wedding. Spectacular! I worked with Hawaii Event Lighting for my wedding and I can't say enough good things about them. I'm sure in the grand scheme of things my wedding was one of their smaller events, but they still treated me like I was their top priority. Hannah was great about responding promptly to phone calls and e-mails and finding ways to work within my budget while still fulfilling the vision I had for the wedding. On the day of the wedding, John was there to make sure everything ran smoothly. I'd work with Hannah and John again in a heartbeat - they're awesome at what they do! I cannot tell you how BEAUTIFUL the lighting was the night of our wedding. Mark and I say that it was definitely the highlight of our night! It was so AWESOME. More than I had ever expected. It was like the lighting I was dreaming about after seeing shots of lighting on the show platinum weddings. You guys are fabulous! You are both easy to work with not to mention, accommodating. I wanted to say Mahalo Nui Loa for lighting our wedding reception at The Keauhou Beach Resort on August 15th. You were by far the easiest person to work with. You truly embody the ALOHA SPIRIT. Thank you for your patience with all my questions and for making cost efficient, yet beautiful suggestions to help create the vision. Mahalo and best of luck in the future.